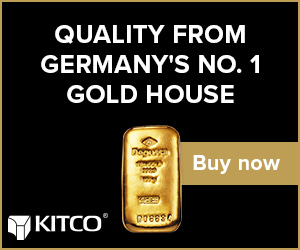 (Kitco News) - Gold and silver prices are moderately lower in early U.S. trading Monday, on normal downside corrections amid their uptrends and after both metals hit multi-month highs last week. A firmer U.S. dollar index and upbeat trader and investor attitudes are also working against the precious metals markets to start the trading week. April gold futures were last down $6.70 an ounce at $1,315.40. March Comex silver was last down $0.226 at $15.705 an ounce. European and Asian stock markets were mixed in quieter dealings overnight. Chinese markets are closed this week for the Lunar New Year holiday, which could make for quieter trading in world markets this week. U.S. stock indexes are pointed toward near steady openings when the New York day session begins. Traders and investors are in generally upbeat moods early this week, following a strong U.S. jobs report released last Friday, and on ideas the U.S. and China are moving closer to a trade deal as the early-March deadline for an agreement approaches. U.S. and Chinese officials are set to meet again in China in mid-February, after meeting last week in Washington, D.C. In overnight news, the Euro zone producer price index for December came in at down 0.8% from November and up 3.0%, year-on-year. That’s yet another inflation report from a major world economy that is not at all worrisome. The outside markets today see the U.S. dollar index trading higher. Meantime, Nymex crude oil prices are slightly up and trading just above $55.00 a barrel. U.S. economic reports due for release Monday includes the ISN New York report on business, manufacturers’ shipments and inventories, and the employment trends index. March silver futures bulls have the near-term technical advantage. A 2.5-month-old uptrend is in place on the daily bar chart. Silver bulls' next upside price breakout objective is closing prices above solid technical resistance at $17.00 an ounce. The next downside price breakout objective for the bears is closing prices below solid support at $15.50. First resistance is seen at today’s high of $15.935 and then at $16.00. Next support is seen at $15.61 and then at $15.50. Wyckoff's Market Rating: 6.5.